We're going to be discussing the possibility of extraterrestrial life on tonight's LKL – do aliens exist, and will we ever get to meet them?? Some say they've already been to Earth – and Investigation Discovery put together this list of TOP TEN UFO ENCOUNTERS! 10. Angel Hair of Oloron, France – One afternoon, in October 1952, dozens of witnesses reported seeing a very unusual sight in the sky — a cylinder surrounded by a group of discs, each of which had ribbons of white smoke emanating down from it. 9. Ronald Regans UFO Sighting – In 1974, Ronald Reagan, then governor of California and future U.S. president, mentioned to journalist Norman C. Miller of the Wall Street Journal that he had once seen a UFO. 8. Foo Fighters – Many people know the Foo Fighters as an American rock band, but the name was first used to describe unidentified flying objects frequently spotted by pilots and sailors during World War II. 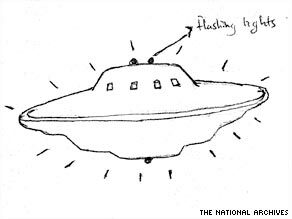 Prior to Jet fighters being very common in the sky's above the once friendly lands of America in the 1950's, UFO's could be seen in many various shapes and sizes across America. For a full week they were sighted hovering over and near the White House. The US Military chose to harass, fire on them, and attempt to destroy them with every opportunity given to them. I am reminded of what the evil King Herod would have done if he could to the 3 Wise Men, exactly the same thing if he had F-4 fighter jets and rabid troops with 105mm artillery pieces to fire at them. Yes, times have changed, sadly however Evil World leaders have not changed in any fashion, not even one iota. A great many infants died under what appears to be a order by King Herod. Even more infants appeared to have died as a result of a order by the President of the United States to test thousands of Atomic Weapons above ground which poisoned the air and milk which infants breathed and drank resulting in their deaths. The resulting Van Allen belt of radiation in outer space around the Earth would have quickly poisoned our astronauts during that time. Was that by design? To paraphrase “The road to Heaven in a narrow, difficult one.” And I’m very glad and thankful that God made it that way.. Besides, with the help of his beloved son Jesus Christ, it’s not really that difficult, since it’s really the Jesus Christ or the Holy Spirit in us that musters the power necessary to fallow the will..
Point his.. Jesus Christ among many things is a gentleman.. And He won’t deny anyone the opportunity to fallow the big wide road and believe in Ophra Winfrey, Borak Obama, UFO’s, etc, etc. Some people look at crystal balls.. Whatever.. I don't like musters on my fallow...just a little horseradish set is apart from the gamy taste. March 13th 1997 I flew into Pheonix from Seattle around 5 or 6PM. My limo driver was excited to tell me that you, Larry King, were sitting with him at the gate. I wondered if the driver had mentioned that I was an alien abductee or if he even knew? Then I passed you in the corridor. I was wearing a long brown, leather trench coat and hat with sun glasses. When you came out of the men's room into the walkway I passed you making eye contact briefly, but really not wanting to speak to you....not even for a moment. I was sceduled to give a seminar in Sedona. Then that night, just a few hours later, began the Lights over Pheonix. I wrote a book creating a chronicle of my experiences with the beings/entities, which seems quite ong ago now and a psychologist used my experiences to finish her dissertation. I lectured publicly for about 10 years or so but pretty much on my terms, Noetic Sciences groups and other groups open to this topic rarely did I speak on a public forum. They all seem a little too crazy for me. Further, I learned really early on that there is a very large faction of the population who do not want to know and would do me harm. Please note everyone..........these UFOs are most probably demons masquerading. They can appear as anything I think. How about the Rosewell incident in 1947..........where a UFO supposedly crash-landed in a field and dead aliens were found in the wreckage. There seemed to be some cover-up of this. You can GOOGLE it. I really don't know what to make of this honestly. As usual, the Russian UFO history and sightings are ignored. As a researcher of Russian and Soviet paranormal phenomena, and author and co-author of books about Russian UFO phenomenon, I consider this to be reprehensible. Ignorant people put together such lists. Nations like Russia, China and India are simply discarded. Australia is not included, and Asia is overlooked. There has been tremendous UFO activity in Eurasia; Russia/USSR has had numerous cases observed by military, scientists, intelligence officers, as well as civilians... to no avail, it seems. The Voronezh/Borisoglebsk; the 1980 Moscow and vicinity waves; the triangular objects over Russia way before Belgium; the USOs in the waters of Russia, Ukraine, and Asia; the Monchegorsk Object; the T-134 case of 1984; the Dalnegorsk Crash; the Usovo 1982 case that almost started a nuclear war; the 1976 "dancing" spheres over a submarine base; the Kola Peninsula observations; the Maritime Province UFO sightings; the 1908 Tunguska Phenomenon; the 1892 "dirigible" sightings; the SETKA, a top secret Soviet program for UFO research in the USSR; the KGB UFO files; credible sightings by cosmonauts; UFOs over China; the Sea of Okhotsk and the Devil's Sea cases;...all were ignored by those who compiled the list. I have nothing but scorn for the ignoramuses. So, with the Billy Meier case still the only scientifically proven, still ongoing UFO contact case, with six categories of still irreproducible physical evidence, and volumes of specific, prophetically accurate scientific and world event related information...why do you, dear reader, still tolerate it's being covered up, suppressed and ignored by the media? It was so common, in the past, to hear about UFO's they are like seeing geese...today. I think people have to wake up if they think we are the only life form in the universe. Even if we don't see or come incontact with them we are not the only life forms out there. I would like to have viewed Hawking's show, but in MT and FL "Deadliest Catch" aired all day. I just checked with FL, they didn't get the program, neither did viewers of Discovery Channel in MT. So, you promoted a program which FL and Bresnan Cable in MT did not air. Sorry, please ask these monopoly cable companies to stop airing reruns and to promote cutting-edge science. I pay Bresnan Cable over $100/mo. for what? These cable companies are too big, and they have failed me often. I want competition. Break up the monopoly cable companies. Totally agree with Jennifer's comments. So wanted to watch the Hawking's show as well and got stuck with a rerun on the Discovery channel here in Fl, thanks to Comcast cable. Any chance it may be rebroadcast somewhere else or could I get the program downloaded from somewhere ? Mr. King I assume you are but I am not sure if you are truly able to voice your opinion about UFO's, as far as the powers that be there at CNN are concerned. But I must say this. Those who think the public for fools will soon wonder if they were not foolish for that thought. Some secrets are valid and must be upheld, but if by your actions and deeds you continue to treat your people like they are totally ignorant and stupid, what will become of you when they discover truth and the Light finds them without regard to how well oaths and secrets were contained. I feel sorry for those who willingly decive the millions. I don't want millions of people wishing ill of me, the collective thoughts of all that negitive energy directed at me would surely harm me if they didn't get to me first. I am not grouping you in any way with these people. I belive you are free and share with the world what you can. Thank you sir. remember to watch the star. Your reporter misspelled the name of President Ronald Reagan, as "Ronald Regan." Regan was Reagan's chief of staff, and also the name of a spy we caught around that time.